There is accumulating evidence that jellyfish contribute significantly to biological carbon cycling and that their carcasses can have controversial effects on seafloor ecosystems. Moreover, changes in the thermal properties of the ocean, ocean chemistry and direct anthropogenic effects can seriously modify jellyfish populations in surface waters and potentially alter the importance of jellyfish in the biological pump relative to other forms of detritus. However, no studies have ever quantified the flux rate of jellyfish carcasses (jelly-falls) to the seafloor throughout the year, or quantified how jelly-fall C and N fluxes compare to phytodetrital fluxes. In this study, we documented the seafloor abundance of jelly-falls over a 1-year period in the jellyfish-dominated Lurefjord, western Norway. A total of 9 jelly-falls were documented from 768 seafloor images over the course of the study, equivalent to 0–13.4 mg C m−2 and 0–2.1 mg N m−2 of jellyfish material being deposited in the deep fjord basin. Assuming that jellyfish removal rates and phytodetrital flux rates from nearby fjord environments are similar to Lurefjorden, we estimate that the jellyfish C and N fluxes to the seafloor were 0–72.8 mg C m−2 d−1 and 0–11.2 mg N m−2 d−1 at the time of sampling. In addition, we estimate that the maximum jellyfish carcass flux rates were equivalent to 96 and 160% of the phytodetrital C and N flux that would arrive at the seafloor where the jelly-falls were recorded. These results imply that jelly-falls most likely contribute significantly to detrital C and N fluxes in at least one jellyfish-dominated environment, despite often being recorded in low abundances. If more fjord environments become jellyfish hotspots as a result of water column darkening, the contribution of jellyfish C and N in the biological pump will potentially increase, necessitating the conceptual inclusion of a jelly-pump in future fjord biogeochemical cycling studies. Concerns about declining ocean health are supported by numerous lines of evidence including ocean warming (Levitus et al., 2000; Hoegh-Guldberg and Bruno, 2010), hypoxia (Diaz and Rosenberg, 2008; Keeling et al., 2010), eutrophication (Valiela et al., 1997) and acidification (Hoegh-Guldberg and Bruno, 2010). Many of the world's fisheries also appear to be under serious threat from overfishing (Pauly et al., 1998; Worm et al., 2006). These changes are leading researchers to predict that many of the world's oceans are regressing to an earlier stage of ecosystem development (i.e., “ecosystem resetting”), where the abundance of opportunistic r-strategists increases (Odum, 1985). Jellyfish are highly opportunistic because they are less sensitive to hypoxia compared to fishes and crustaceans (Vaquer-Sunyer and Duarte, 2008), warmer temperatures enhance jellyfish reproduction (Purcell et al., 2007; Purcell, 2012), and overfishing enhances prey availability and reduces competition pressure for jellyfish (Lynam et al., 2006). Eutrophication also benefits tactile predators like jellyfish by increasing water-column turbidity, whereas visual predators (e.g., fish) are at a competitive disadvantage compared to jellyfish in this situation (Sørnes and Aksnes, 2006; Sørnes et al., 2007; Aksnes et al., 2009). While recent meta-analyses have shown that global jellyfish populations have only increased slightly since the 1970s (Condon et al., 2012), numerous areas throughout the world have experienced large jellyfish population expansions (Lynam et al., 2006; Purcell, 2012). The deep-sea mesopelagic medusa Periphylla periphylla (Scyphozoa, Coronatae) is a common inhabitant in many deep-water fjords along the Norwegian coast (Gorsky et al., 2000; Youngbluth and Båmstedt, 2001), and evidence is accumulating of this species increasing in Norwegian fjords as a result of water column darkening (Aksnes et al., 2009). The largest population of P. periphylla is thought to exist in Lurefjorden, western Norway. Here, the population is several orders of magnitude larger than in other fjords and exceeded 50,000 tons during the last decade (Youngbluth and Båmstedt, 2001; Sørnes et al., 2007). The large biomass is thought to be maintained by the shallow 20 m deep sill and narrow entrance to the fjord restricting advection of jellyfish out of the fjord. The negatively phototactic behavior of the species reinforces this effect as jellies avoid upper water layers during daylight hours (Youngbluth and Båmstedt, 2001) leading to a stable population size throughout the year (Sørnes et al., 2007). Because jellyfish are renowned for their ability to rapidly form massive, ephemeral blooms (Richardson et al., 2009) and their carcasses have high sinking speeds (Lebrato et al., 2013), gelatinous zooplankton carcasses (hereafter referred to as jelly-falls) can provide an important transport pathway for carbon (C) and nitrogen (N) to the deep seafloor. In recent years, a number of studies have described large accumulations (covering up to 100% of the seafloor, >10 cm thick) of moribund jellyfish at the deep seafloor off Oman (Billett et al., 2006) and the Ivory Coast (Lebrato and Jones, 2009). In both studies the C-content of the jelly-falls exceeded the annual phytodetritus flux for both areas. In early 2011, Sweetman and Chapman (2011) documented jelly-falls in a jellyfish-dominated fjord in Norway, but noted that their abundance was low and organic enrichment associated with them was highly localized. These observations suggest that jelly-falls are not as important in pelagic-benthic coupling in Norwegian fjords as they are elsewhere. However, more recent evidence has emerged that the contribution of jelly-falls to carbon and nitrogen transport may be seriously underestimated if jelly-falls are rapidly removed from the seafloor by benthic and demersal scavengers (Sweetman et al., 2014). In other words, it is possible that the low abundance of jellyfish falls noted by Sweetman and Chapman (2011) may have resulted from their rapid consumption by seafloor scavengers, so that they were absent in later photographic surveys, rather than the contribution of jelly-falls to total carbon and nitrogen fluxes being low. In light of expanding jellyfish populations along the Norwegian shelf margin and other areas around the world, and the fact that they can significantly alter seafloor habitats through smothering (Billett et al., 2006; Lebrato and Jones, 2009; Lebrato et al., 2012), and supplying energy to benthic and demersal scavengers (Sweetman et al., 2014), it is important to deepen our understanding of the importance of jelly-falls in transporting and C and N to the seafloor. In this case study, we provide the first assessment of jellyfish particulate organic matter (POM) fluxes to the seafloor throughout the year in a deep-sea fjord environment, and compare the estimated fluxes to phytodetrital fluxes from a nearby fjord. We show that despite the fact that low abundances of jelly-falls are sometimes recorded in jellyfish-dominated fjords (Sweetman and Chapman, 2011), fluxes of gelatinous C and N may be relatively similar or even exceed phytodetritus C and N fluxes at certain times of the year, highlighting their potential importance in the biological pump. Lurefjorden (060° 41.7′ N; 005° 08.5′ E) is an oxygenated fjord (2.2–6.8 ml O2 l−1, Sørnes et al., 2007), situated in western Norway (Figure 1). The deepest point in the fjord is found in the central basin at 447 m, where water temperatures (6–7°C) and salinities (33–34) remain approximately constant throughout the year (Youngbluth and Båmstedt, 2001). Multiple seafloor photograph transects were conducted in the Lurefjorden in November 2010 (6 transects, total of 129 images), March 2011 (7 transects, total of 212 images), July 2011 (8 transects, total of 275 images) and November 2011 (5 transects, total of 152 images) aboard the RV Solvik (Figure 1, Table 1). Photographic transects were conducted both along the central axis of the fjord basin, as well as across the basin between the steep walls (see Table 1). Photographs were taken with an Ocean Imaging Systems DSC 12000 camera and strobe system with a Nikon D90 digital Single Lens Reflex (SLR) camera (camera settings: ISO 400, f-stop 8.0, and a 1/25 s. exposure), mounted on a 1.2 × 1.2 m stainless steel frame using the methods described in Sweetman and Chapman (2011). Each photograph had a resolution of 12.9 megapixels, and covered an area of approximately 3 m2 (Sweetman and Chapman, 2011). Dual lasers (separated by 26 cm) provided a length scale for all images. Photographs were taken every 10 m along the length of each transect, which varied in length from 0.1 to 0.5 km depending on the bathymetry of the seafloor and presence of man-made objects (e.g., submarine cables). For each photograph the position, depth, and time were recorded. At the end of each transect the camera frame was retrieved and all photographs were downloaded to a laptop computer. Figure 1. Location of Lurefjorden, western Norway (yellow star), and approximate location of the study area in Lurefjorden. Table 1. The number of jelly-falls documented at the seafloor, their contribution to seafloor C and N stocks, and the area photographed at different times of year. For each image in which jelly-falls were found, we measured the coronal diameter of each jellyfish using the methods described in Sweetman and Chapman (2011). Jellyfish coronal diameters (X) were converted to dry weight (Y) using the regression Y = −4.728 + 3.123X (r2 = 0.98 of natural logarithmic transformations: Youngbluth and Båmstedt, 2001) and then to carbon (C) content (ZC) using the regression ZC = 5.373 + 0.924Y (R2 = 0.97 of natural logarithmic transformations), and nitrogen (N) content (ZN) using the regression ZN = 3.396 + 0.971X (R2 = 0.98 of natural logarithmic transformations: Youngbluth and Båmstedt, 2001). To estimate the flux of jellyfish particulate organic carbon (POC) and nitrogen (PON) to the seafloor throughout the year, we calculated the seafloor jellyfish C and N stock m−2 from the sum of total jelly-fall C and N content (see Section Sampling Location and Photographic Transects) divided by the area surveyed in each cruise. As all jelly-falls were found in the deep basin (447 m), we included only the deepest transects (20 transects in total) in our analysis (Table 1). Areal C and N stocks were then divided by minimum and maximum removal rates of single fresh P. periphylla jellyfish carcasses (% d−1), measured in the nearby Sognefjord in October 2012 using the methods of Sweetman et al. (2014), to derive the minimum and maximum C (mg C m−2 d−1) and N (mg N m−2 d−1) flux estimates. A total of 768 seafloor photographs were taken over the four research cruises with the drop camera system, which amounted to approximately 1800 m2 of seafloor being photographed in total. Out of these 768 photographs, 9 showed jelly-falls at the seafloor (Table 1, Figures 2A–D). The number of jelly-falls recorded in the seafloor photographs was positively correlated with the area surveyed, which explained 87 % of the variance in jelly-fall abundance (Figure 3). Figure 2. (A–D) Seafloor photographs showing the presence of jelly-falls in the deep-basin of Lurefjorden. P. periphylla jelly-falls being actively scavenged by unknown decapods in July 2011 (Photographs A–C) and November 2011 (Photograph D). White arrow designates a small jellyfish carcass. The white scale bar is 50 cm in length. Jelly-fall photographs from the deep-basin captured in March 2011 can be found in Sweetman and Chapman (2011). Figure 3. The number of jelly-falls documented at the seafloor as a function of seafloor area photographed. The linear trend-line intercept is set to 0,0. Only the fjord basin transects (447 m depth) were included. The amount of jellyfish C deposited at the seafloor was 0, 13.4, 4.1, and 5.5 mg C m−2 in November 2010, February 2011, July 2011, and November 2011, respectively. 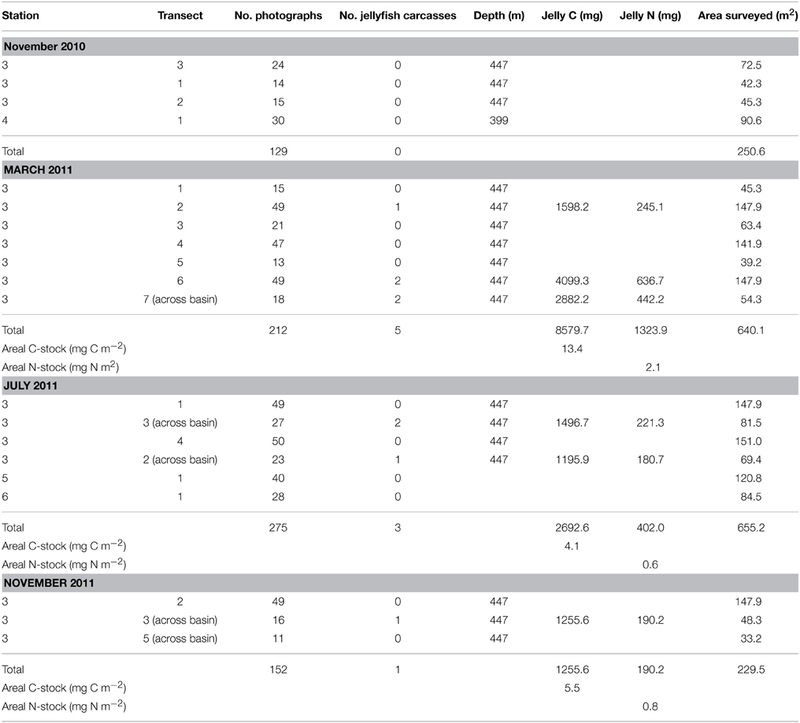 In terms of the amount of jellyfish N deposited, 2.1 mg N m−2 was deposited in February 2011, and 0.6–0.8 mg N m−2 was deposited in July and November 2011, respectively (Table 1). Fresh P. periphylla removal rates recorded in the Sognefjord in October 2012 ranged from 303–543% d−1 (Sweetman et al., 2014). Using the overall mean stock estimates from the four sampling periods and minimum and maximum removal rates of 303–543% d−1, we estimate that the minimum and maximum jellyfish C flux rates to the seafloor in Lurefjorden were 0 (November 2010), 40.6–72.8 (March 2011), 12.5-22.3 (July 2011), 16.6–29.7 mg C m−2 d−1 (November 2011), while minimum and maximum jellyfish N-fluxes were 0 (November 2010), 6.3–11.2 (March 2011), 1.9–3.3 (July 2011), and 2.5–4.5 mg N m−2 d−1 (November 2011). This study has shown that jelly-falls contribute to the downward flux of C and N throughout the year in a jellyfish-dominated fjord environment. Given that Lurefjorden has only relatively recently become a hotspot for jellyfish (Fosså, 1992), it seems likely that the importance of jelly-falls in pelagic-benthic coupling will increase in other fjords if they become jellyfish hotspots due to eutrophication and water column darkening (Sørnes et al., 2007; Aksnes et al., 2009). The jellyfish carcass flux rates that we quantified for Lurefjorden are highly dependent on removal rate data collected from another fjord setting. While the Sognefjord is comparable in terms of bottom water environmental characteristics (O2 concentration ~200 μmol L−1, temperature ~7.5°C, salinity ~35: Sweetman et al., 2014) it is approximately 800 m deeper than Lurefjorden. Providing jellyfish removal/scavenging rates change as a function of depth, using removal rate data from the deeper Sognefjord site could thus have led to an under- or overestimate of our jellyfish C- and N-fluxes in Lurefjorden. Scavenging on jelly-falls has been documented in Lurefjorden (Sweetman and Chapman, 2011) and was apparent in this investigation (Figures 2A–D), which supports our use of scavenging data to derive flux estimates here. Furthermore, we are confident that our estimates were not overestimated for the following reasons: First, despite previous studies showing that scavenging rates can increase with depth (Dayton and Hessler, 1972; Hessler et al., 1978), scavenging studies at 5500 m in the western Pacific using Chrysaora sp. jellyfish as bait recently showed a much slower jellyfish scavenging process compared to at 1250 m (Sweetman et al., 2014). Macrourid fish scavengers (Coryphaenoides spp.) 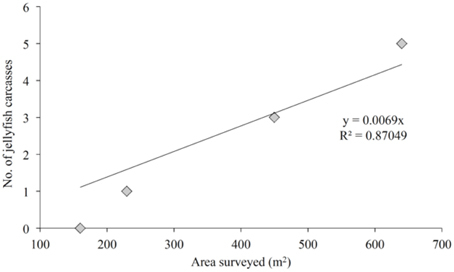 did respond to jellyfish baits, but less than 3% of the material was consumed over a period of 4 h, corresponding to a jellyfish carcass scavenging rate of <20 % d−1 at 5300 m (Sweetman and Nomaki unpublished data), which suggests that jellyfish removal rates possibly decline with depth. If true, this would mean that our estimates are too low. Second, our flux estimates are only based on visible jellyfish carcass standing stocks, and ignore the importance of other jellyfish particulate material that is not possible to see in the seafloor images. Our use of jellyfish body sizes to estimate the C and N content of each jelly-fall using equations derived with freshly caught jellyfish (Youngbluth and Båmstedt, 2001) will fail to account for any C and N that leaches out as the jellyfish carcass sinks through the water column, potentially leading to an over-estimate in our flux data. However, because jellyfish carcasses sink very rapidly (~850–1500 m d−1, Lebrato et al., 2013), and Lurefjorden is relatively shallow (447 m), potential overestimates in our biomass and flux data are likely to be minimal. Jelly-fall numbers were maximal in March 2011. It is therefore possible that the frequency of jelly-fall events in Lurefjorden is seasonal. However, we think that this is unlikely given that P. periphylla is a perennial species and does not display boom-bust dynamics like other jellyfish taxa (Youngbluth and Båmstedt, 2001), but maintains a persistent population level throughout the year (Sørnes et al., 2007). The higher flux estimates calculated for March 2011 could have been partly an artifact of the seafloor survey design, since the number of jelly-fall events was positively correlated with the area surveyed, and a greater number of images were taken in March 2011 (212 photographs) compared to November 2010 (129 photographs) and 2011 (152 photographs) (Table 1, Figure 3). The jellyfish flux estimates recorded here came from seafloor photographs made in the deep central basin of Lurefjorden. 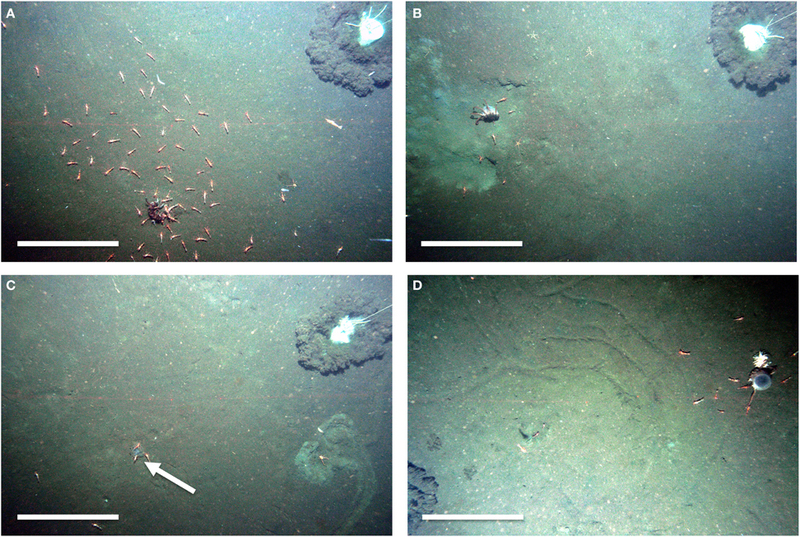 No jelly-falls were visible in seafloor images taken in shallower areas of the fjord, which implies that the deep basin may concentrate organic matter, including jelly-falls, in a similar way to that of submarine canyons channeling organic matter to the seafloor (De Leo et al., 2010, 2014; Vetter et al., 2010). Channeling effects caused by seafloor bathymetry were also apparent from the fact that 6 out of 9 of the jelly-falls documented during the course of this study were found along photographic transects made between the side walls of the fjord (Table 1), suggesting that the jelly-falls may have arrived at the basin floor by rolling down the steep walls of the basin. The amount of C and N deposited as jellyfish biomass over the year-long study was significantly less than that observed off the Ivory Coast (1–>20 mg C m−2, Lebrato and Jones, 2009) and in the Gulf of Oman (1.5–75 g C m−2, Billett et al., 2006). Our flux estimates were also lower than jellyfish flux rates of 1 g C m−2 d−1 documented at 100 m in Hudson Bay by Lalande and Fortier (2011) [calculated assuming an organic C content of 0.08 mg C for Aglantha digitata from size: biomass data in Pertsova et al. (2006), and a maximum abundance of 13000 A. digitata individuals m−2 d−1 collected by a sediment trap (Lalande and Fortier, 2011)]. However, it is unclear if the jellyfishes sampled by Lalande and Fortier (2011) were dead at the time of capture since A. digitata is known to undergo diurnal vertical migrations. The high flux rate measured by Lalande and Fortier (2011) may therefore have resulted from the sediment trap capturing and preserving vertically migrating hydromedusae rather than dead carcasses, which precludes a definitive comparison to our data. The amount of organic matter deposited as gelatinous biomass off Ivory Coast and in the Gulf of Oman exceeded the annual amount of phytodetritus that settles to the seafloor in these two areas (Billett et al., 2006; Lebrato and Jones, 2009). Phytodetrital flux estimates do not exist for western Norwegian fjords, except for in Wassmann (1984) who recorded phytodetrital fluxes of 107 g C m−2 year−1 and 12 g N m−2 year−1 at 90 m depth in a nearby fjord (Fanafjorden, <30 km to the south of Lurefjorden), where P. periphylla does not exist (Hosia and Båmstedt, 2007). Applying the flux algorithms of Martin et al. (1987) and assuming similar phytodetritus fluxes exist to this day at Wassmann's study site and Lurefjorden, we estimate that the average amount of phytodetritus arriving at the seafloor where all the jelly-falls were recorded (447 m) would be 28 g C m−2 year−1 and 2.5 g N m−2 year−1, which equates to approximately 76 mg C m−2 d−1 and 7 mg N m−2 d−1. 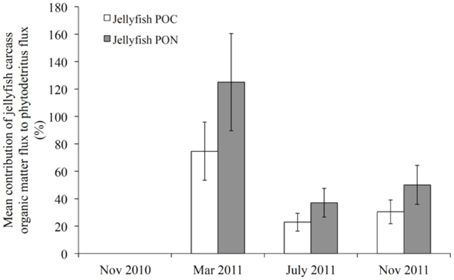 The average jelly-POC flux in March 2011 was fairly similar (75%) to the estimated daily phytodetrital C flux, and ranged from 0 to 30% at other times of the year (Figure 4). In terms of nitrogen fluxes, average jelly-PON flux exceeded the phytodetrital flux by 25% in March and ranged from 0 to 50% at other times of year (Figure 4). Thus, while the standing stock of jelly-falls recorded throughout the study was relatively low in comparison to other studies (Billett et al., 2006; Lebrato and Jones, 2009), jelly-falls most likely contributed significantly to detrital C and N fluxes over the year in the basin of Lurefjorden. Because particulate organic matter fluxes in jellyfish-dominated environments may be seriously underestimated by failing to account for the contribution of jellyfish organic matter, our results highlight the necessity for including a jelly-pump component in future biogeochemical cycling studies in jellyfish hotspots. On a positive note, if jellyfish biomass continues to increase in fjord environments as a result of anthropogenic changes (Sørnes et al., 2007; Aksnes et al., 2009), and climate change modifies pelagic-benthic coupling in these environments (e.g., Mora et al., 2013), our results suggest that jelly-falls may help alleviate problems caused by excessive nutrient loss and reduced energy flow to higher trophic levels, which are characteristic symptoms of stressed environments (Odum, 1985). Figure 4. Mean estimated contribution of jellyfish carcass C and N to phytodetritus fluxes at 447 m (based on flux data in Wassmann, 1984). Error bars denote the minimum and maximum estimated contribution. AKS and AC collected the data; AKS analyzed the data and wrote the manuscript; AKS and AC edited the manuscript. C.R. Smith provided technical drawings for the fabrication of our Yo-Yo camera frame. We thank him for donating these to us. We would like to thank L. Pedersen for his invaluable assistance during the 4 research cruises and for building our camera frame. We thank D.O.B. Jones for making Figure 1, and A.J. Gooday and K.S. Meyer, and 3 referees for providing feedback on an earlier version of the manuscript. This research was supported by a large-scale research grant to AS from the Norwegian Research Council (NFR project #196699/S40). Copyright © 2015 Sweetman and Chapman. This is an open-access article distributed under the terms of the Creative Commons Attribution License (CC BY). The use, distribution or reproduction in other forums is permitted, provided the original author(s) or licensor are credited and that the original publication in this journal is cited, in accordance with accepted academic practice. No use, distribution or reproduction is permitted which does not comply with these terms.